If you haven't, you really should think about it. It's one of the most important plays in hockey. If you don't teach your players how to do it properly, it WILL cost you goals and possibly the game. Think about it. When do you dump the puck? When you want a line change - If you don't get the puck deep enough, there is a charge of the opposition as your players are coming on/off the bench. When you can't beat the other team through the neutral zone - If you don't have a play, dump it. If you don't and you lose it (because you just tried to go around/thru 3 players) suddenly, your team is heading North and the puck and opposition is going South. Both scenarios will cost you goals and/or a really irritated Goalie (not to mention your coach). Smart play will win you hockey games and teaching your players to play smart will only make them better players. 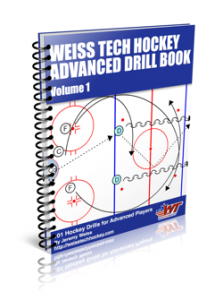 Both of these drills are better when you have a full rink but can be worked from center red in, if you only have half a rink. This is about roller hockey not ice hockey. Anonymous above is correct. Don't dump the puck. There is no neutral zone, it's roller hockey. Quit thinking with an ice hockey mentality. If you need to change, control the puck behind your own net.